The Dragon Duo is a St. Louis-based string ensemble offering eclectic musical accompaniment tailored to suit your taste and needs for any special event. We offer standard classical repertoire as well as pop favorites, film hits, folk Celtic, and other styles. Whether you seek the elegance of traditional classical music or a fresh, modern feel with the pop songs you know and love, we will do what it takes to make your event special and unique. Whatever your preference is rest assured that the Dragon Duo will deliver with the utmost elegance and professionalism. We also offer trio and quartet options if you would like a larger ensemble. Dragon Duo did a WONDERFUL job! Dragon Duo provided the ceremony music for my daughter's wedding last weekend and they were amazing! Super easy to work with--after signing the contract, we traded a few emails, they showed up and did their thing--quite well I might add. Reasonably priced too. Can't go wrong with this vendor--I highly recommend them. Melissa was the contact and she was always responsive and helpful. Beautiful Music. Organized and Professional Service! Could not have asked for better accompaniment for our wedding ceremony. They have such a broad repertoire we were able to use some more unique processional music. We received so many compliments from wedding guests. Melissa was incredibly organized and professional; I knew exactly what to expect every step of the way! The price was very reasonable as well. We would choose them again and again. WE LOVED THE DRAGON DUO! We heard about them because they performed for my brother-in-law's wedding and my husband's uncle's wedding. They had such glowing reviews of their experiences that we HAD to book Dragon Duo. Our own experience was equally fantastic. The coordination before the wedding was easy with Melissa - we emailed back and forth, she had song recommendations and samples when I needed them and actually her preparation questions were what helped me shape my outline for the ceremony. She was familiar with our venue and able to help us make some decisions (they have options for how many musicians, how the sound will fill the space, etc...). We did not have them play during the ceremony itself (we didn't do a unity candle or rose thing) but I wish we would have. After the ceremony we got NUMEROUS comments about how much the guests loved our modern music choices for our entrances/exit and how much they just enjoyed listening to them play beforehand. Another thing we didn't do was get a wedding video and I honestly don't remember the song playing for me to walk down the aisle!! I WANT TO HEAR IT! But that's on me, not the Dragon Duo, obviously. Dragon Duo was SO Great to work with and the ceremony turned out so beautiful thanks to them! Great music choice for our wedding! We had Dragon Duo provide the music for our daughter's wedding a few weeks ago. It was an excellent choice! The music was beautiful and elegant! I couldn't be happier that we chose Dragon Duo to perform during our wedding ceremony and cocktail hour. They are true professionals, and their music and timing was flawless during our ceremony. We even chose a song for our unity candle lighting that was not in their repertoire, and they came up with a beautiful arrangement for us. Weddings by nature tend to be stressful, so it was very comforting to know that we wouldn't have to worry about our musicians. Many guests told us how wonderful the music was afterward. Dragon Duo made our day really special, and we can't thank them enough! If you're looking for violinists for your wedding, you'll be in great hands with Melissa and Jenger. These two played for my wife and I wedding and they were amazing. Definitely helped set the tone for the ceremony. Awesome people to work with. she was prompt, very professional and the music was beautiful. They were absolutely AMAZING! They showed up right on time and really worked with us throughout all the chaos. Initially we had them slotted for social hour (5-6) and then again a little while later during dinner (7:15-8), but things moved quicker than we anticipated and dinner was served at 6:30. They had no problem adjusting! And the music was beyond fantastic. All of our guests, including Brigadier Generals, Colonel's, and Lieutenant Colonel's, claimed this was the best Military Ball they had ever been to. We will definitely be using Dragon Duo again... I've recommended them to literally every person I know. The musicians were more than timely, infinitely patient with the bride's tardiness, and it nearly goes without saying that the music was everything we wanted. They brought something amazing to the occasion, and despite my nervousness, I found their music quite soothing on what would have otherwise been a stressful day. I would say I most enjoyed the subtlety, and unobtrusiveness that they brought with their professionalism. I contacted the Dragon Duo for information to play at our wedding and I was surprised with the prompt response. They were able to help me find a package that fit into my price range and suggested music choices for each part of the ceremony. They were very easy to work with and sounded great during our ceremony. I have gotten many compliments and inquiries on them. These ladies made the night super wonderful. I proposed to my girlfriend(now fiance) with a romantic musical serenade provided by these ladies/angels. They help make the night legendary. This group was highly professional and reasonable priced. They even had other tables trying to request songs. They provided very tasteful background music during the cocktail hour and during dinner. Unfortunately, the noise level was too loud to get a full appreciation for the music, but it definitely added to the ambiance of the occasion. Probably should have opted for the ensemble or trio. Melissa Horine and her Classical Ensemble at my daughters wedding were in my opinion the "best of the best". Relaxed and confident,she makes every song that they play look very easy,when I am sure it must envlove a great deal of hard work and self-discipline.Many of our guest commented glowingly about the music and we ourselves are still talking about it.The only thing I can suggest is that you try them for a booking or two, and see if you agree with my opinion. Happy Wedding! The women of the Dragon Duo met in the orchestra of a high school opera production called “The Reluctant Dragon” and have been playing together ever since. 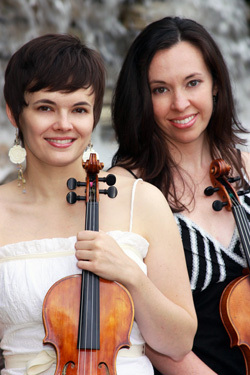 Melissa Hayes began studying violin at the age of ten. She holds a Bachelor of Music in Violin Performance and a Master of Music in Violin Pedagogy from Missouri State University. She is an instructor at the Community Music School and maintains her own private lesson studio, South City Strings. She currently performs with Fiesta Mariachi, and freelances with local rock and country bands. She is a former member of the St. Louis Philharmonic and Gateway Festival Orchestra, Springfield(MO) Symphony Orchestra, Springfield Regional Opera Orchestra, Chamber Orchestra of the Ozarks, and Fort Smith Symphony and has performed with the Mannheim Steamroller, Trans Siberian Orchestra, and toured with The Prophecy tribute to Trans Siberian Orchestra. Jenger Wollard began playing the violin at the age of 10. She graduated from Missouri State University with a Bachelor of Music in Violin Performance and holds K-12 Music teaching certifications in Texas and Missouri. Jenger has performed with the Springfield (MO) Symphony Orchestra, Springfield (MO) Regional Opera, Chamber Orchestra of the Ozarks, Austin Conspirare, Austin Gilligan and Sullivan Society, as well as Kenny Rogers and Rosemary Clooney. She currently resides in St. Louis and teaches orchestra in Rockwood School District. The Dragon Duo and related string ensembles will not play outside in inclement weather or in temperatures below 60 degrees or above 90. The performance area must be shaded from the sun, and adequately protected from any amount of precipitation, including rain driven by wind. Purchaser is prepared to assume includes responsibility for the risks involved.